A Hungarian-American, regarded as the Father of Modern Neuroscience. He gave lectures and influenced the research at the University of Sydney. Founded the Harvard Neurobiology department in 1966. Made contributions to our understanding of vision and neural coding. Known for research on neuromuscular junctions in frogs and presynaptic inhibition. Categories: Radio, Scientist of the Month | Tags: brain, research, science | Permalink. 13th to 18th April – International Dark Sky Week, join in by reducing light pollution (turn off outside lights where possible) and enjoy dark skies. 22nd/23rd April Lyrids Meteor Shower peak. Moon sets shortly after midnight allowing for a dark sky to view the show, approximately 20 meteors per hour. Produced by debris left behind by comet C/1861 G1 Thatcher. Categories: Night Sky this Month, Radio, Science | Tags: astronomy, Moon, radio, science | Permalink. Following the development of a new method for analysis MRI scans of the brain, scientists in the Dept. of Computer Science at the University of Warwick have been able to create an accurate 3D model of the brain. Over a billion individual pieces of data were analysed covering the 47, 636 areas of the brain, called voxels. This data originated from 523 people with autism and 452 people without autism. The researchers isolated 20 areas of difference where the connections between the voxels in the autistic brain were stronger or weaker than the non‑autistic. The areas related to face expression processing involved in social behaviour and another in spatial functions, which the researchers propose are linked to the computations involved in theory of mind of oneself or of others and a reduced connectivity in these regions may be contributing to the symptoms of autism. This methodology may be able to isolate similar areas in people that have other cognitive problems including obsessive compulsive disorder, attention deficit hyperactivity disorder and schizophrenia. Categories: News, Radio, Science | Tags: biology, brain, news, radio, research, science | Permalink. By addition of a chemical called Sodium Formate derived from formic acid, which is found in stinging nettles and ants (among other natural organisms), to a cancer drug called JS07, the drug is approximately 50 times more effective. A group of researchers based at the University of Warwick lead by Prof. Peter Sadler, found that the compound more often used as a food preservative helped to disrupt the cancer cell’s energy generating mechanism forcing the cell to shut down. The research was carried out on human ovarian cancer cells. The effective addition of Sodium Formate would allow the dose of the JS07 drug required to target cancer cells to be reduced – resulting in a reduced toxicity and potential side effects. Furthermore, while the Sodium Formate is used up in the interaction with the cell’s energy generation mechanism, remaining molecules of JS07 can be introduced to a new supply of Sodium Formate and become potent again. It is hoped that research like this could lead to substantial improvements in cancer survival rates. Categories: News, Radio, Science | Tags: biology, cancer, news, research, science | Permalink. A team from the University of Rochester in New York have reported a method of creating waterproof surfaces that could be used to produce easily maintained and hygienic devices. Material would not suffer from rust or icing up in the cold weather. The test materials that were used are platinum, titanium and brass. The material “self-cleans” as dust is drawn away with water droplets as they hit the surface. Previously, waterproofing surfaces has relied on coating with another substance, which fundamentally changing the surface properties of the metal. The method they have used utilises rapid pulses of high powered lasers etching grooves 0.1 mm apart into the surface. Water droplets bounce off the surface if dropped from a short distance and any water sitting on the surface will slide off if the surface is tilted by approximately 4 degrees. A popular hydrophobic material, Teflon, often used on non-stick frying pans for example, has to be tilted to around 70 degrees before water will slide away. However, as with many new techniques, it is currently expensive and time consuming to produce these materials. It takes approximately one hour to create one square inch. There are many other ways to create hydrophobic structures, including coating, chemical etching and electron beams, which are more straightforward. The spacecraft New Horizons is nearing its encounter with Pluto. Launched in 2006, the craft will fly by Pluto in July, but is powering up its systems in preparation, with some images expected back by tomorrow (Tuesday 27th Jan) at the latest. It will be performing correction manoeuvres to make sure the instruments on board will be pointing in the correct direction when it makes its closest approach on 14th July 2015, approximately 11:50 GMT about 13,695 km from the surface. As New Horizons approaches it will be travelling around 14 km s-1, and all the instruments work at different approach distances to get data, so an elaborate observation schedule is planned. Pluto is one of the “classical” planets, the last to be visited by a space probe. We have been able to remotely observe it using instruments like the Hubble Space Telescope, which has distinguished ‘light’ and ‘dark’ features. Be in orbit around the Sun. Be massive enough to be a sphere by its own gravitational force. More specifically, its own gravity should pull it into a shape of hydrostatic equilibrium. Have cleared the neighbourhood around its orbit. The Kuiper Belt is thought to contain many thousands of Pluto-like objects, possibly some that are similar in size to Mars and Earth. Built his own telescopes, grinding the lenses and mirrors himself. He drew Jupiter and Mars, which earned him a job at Lowell Observatory. He was given the task of search for Planet X, a planet hypothesised by Percival Lowell beyond the orbit of Neptune. During WWII he taught navigation to naval personnel at Northern Arizona University. He discovered nearly 800 asteroids, mostly as a by-product during his search for Pluto and other celestial objects. He also was involved in the search for Near-Earth Objects. Venus, Mars and Jupiter are all prominent in the night sky this month. Jupiter rises in the east and is available for observing throughout the night. 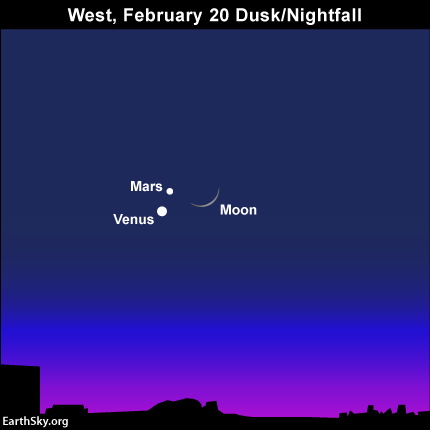 Mars and Venus are setting in the west, and on the 20th Feb will have a fabulous conjunction with the crescent Moon at nightfall on the western horizon. Jupiter is at opposition (closest approach to Earth) on 6th Feb, offering the perfect opportunity to view and photograph the planet. Binoculars offer the opportunity to see the four largest moons of Jupiter and a small to medium telescope will show the cloud bands and Great Red Spot. With thanks to Danny Smith and all the Drive Time Team. Categories: News, Podcast, Radio, Science | Tags: astronomy, material science, news, physics, podcast, radio | Permalink. I’m backing Lunar Mission One. Categories: Uncategorized | Tags: astronomy, Moon, news, planetary science | Permalink. The future of life detection on Mars: We come in peace, but carry lasers! (Guest post for II-I- blog). Categories: Astrobiology, Guest Blog Post | Tags: astrobiology, astronomy, ExoMars, Mars, planetary science, Raman spectroscopy, science | Permalink.